Any gardener will tell you that his art is a grand teacher of patience. One has no choice but to wait for plants to mature and bear fruit when they’re ready. Especially nut trees, they’re not to be hurried. We have several of these in the garden: macadamia, almond, hazel, walnut and pistachio. And finally, after 5 years, one of our female pistachio trees produced a tiny cluster of seeds last November. Even though we’re not yet harvesting nuts from our trees yet, they bring us joy in other ways. 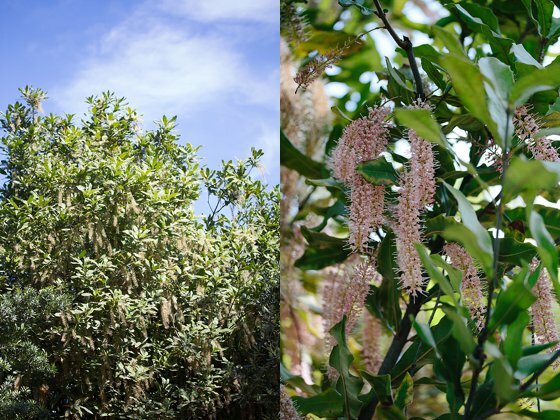 Every spring macadamia trees spoil us with a sublime, sweet fragrance … a lingering scent to remember. Long pink racemes appear in late September, creating a scene reminiscent of the dusty pink tutus in a Degas painting. 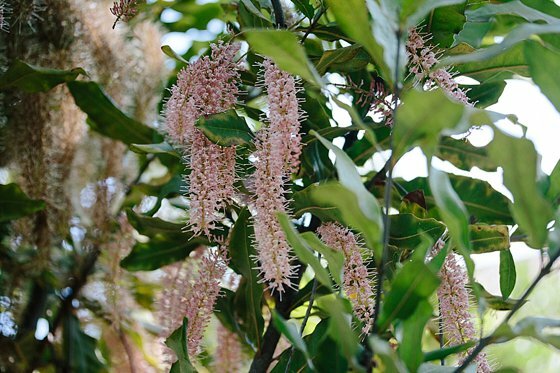 If you want to create a picturesque shady spot in your garden, a macadamia tree might be a fine choice. They are quite undemanding, evergreen and sport dense, dark green foliage. Even though they come from Australia, and are named for a politician (John Macadam), in the spirit of the Rugby World Cup we’ll forgive them all that. You can try Tulbagh Forestry Nursery (Phone:023 230 0694). Unfortunately my garden is so small so I cannot plant all I would love to. Also we have squirrels around so not sure I would get any! I have however planted two almonds on my pavement the the squirrels and perhaps a few for me. My question to you is – do you have any idea where I could get a Carob tree? Also where I could get a Kiwi Fruit plant. I have one I have had for several years but need another for cross pollination ( male/female). Appreciate your help if you perhaps know. I have tried to no avail. Nurseries these days are just retail outlets and really can’t be bothered to try and find trees for a person – so have given up on them. You can contact Anton Roux for the Kiwi plant and he might even be able to help with the Carob tree. Also try Tulbagh Forestry Nursery (Phone:023 230 0694). I have been searching for pistachio trees forever! Any more progress on your trees? Would love to hear. Did you get them from Tulbagh Forestry Nursery also? Hello Stuart, last year some of the female flowers were pollinated by the males but no nuts developed. We got the trees from a contact in Prieska that unfortunately do not grow them anymore.